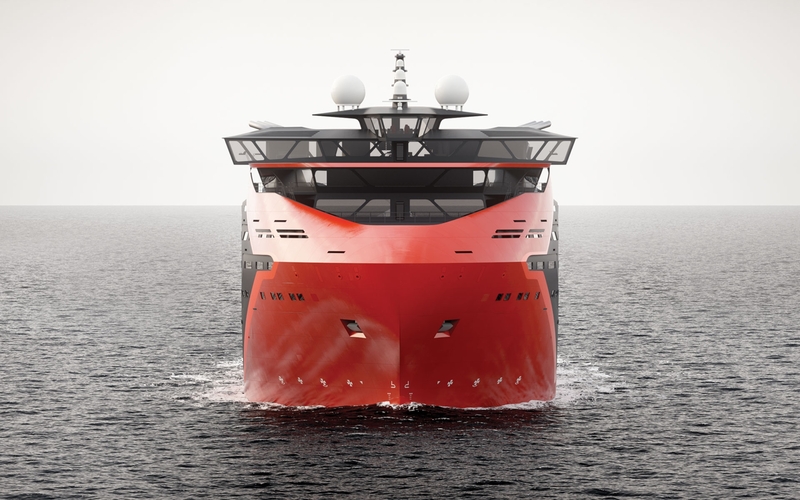 Vard is a concept offshore-subsea construction vessel (OSCV) that features new form to integrate complex functionality with a specific character of a company’s brand. 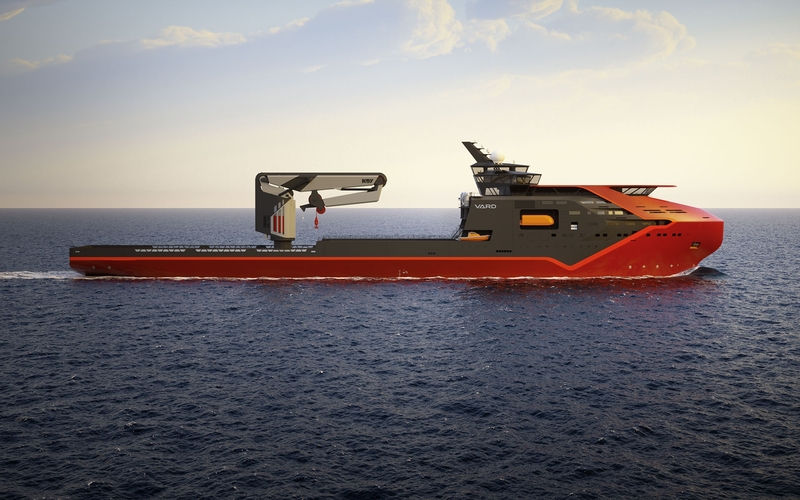 The exterior of the Vard Near-future OSCV is designed to further increase the ship’s efficiency, durability and sustainability. 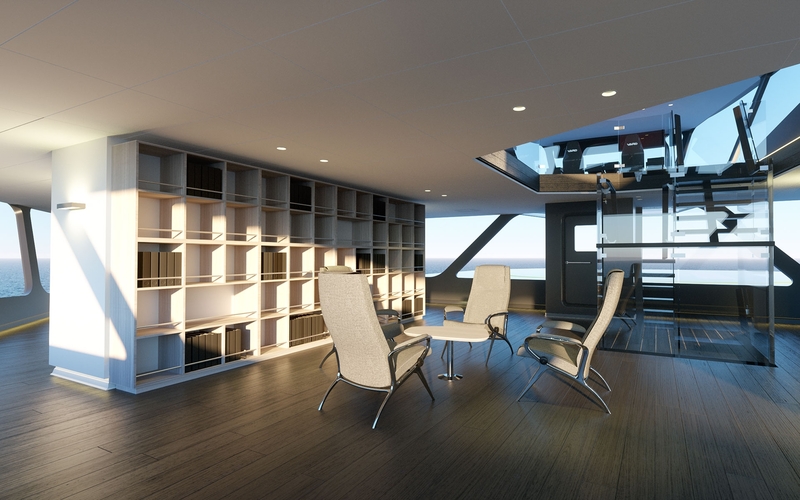 The exterior details are integrated to unprecedented levels, and directly inform the layout of the ship’s interior. The configuration increases visibility from the bridge, lowers the center of gravity, and maximizes both fuel efficiency and deck space. 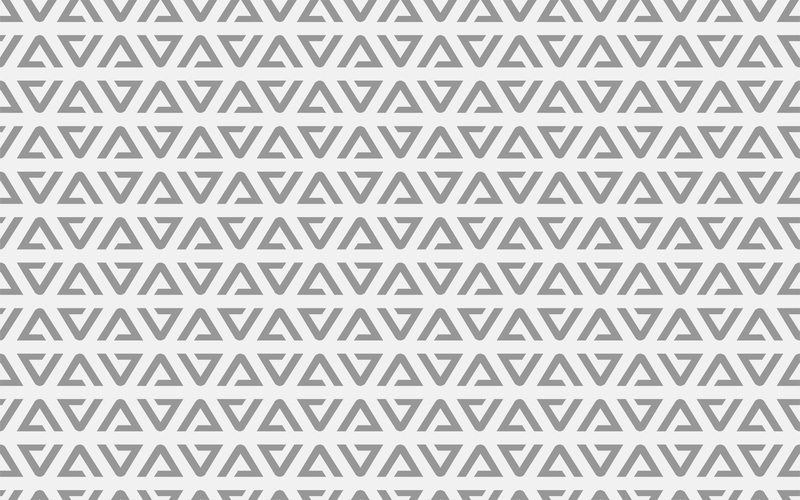 This OSCV features a new, bold and distinctive form factor that scales between different vessel types and sympathetically integrates complex functionality with the need for a strong, brand-specific character. 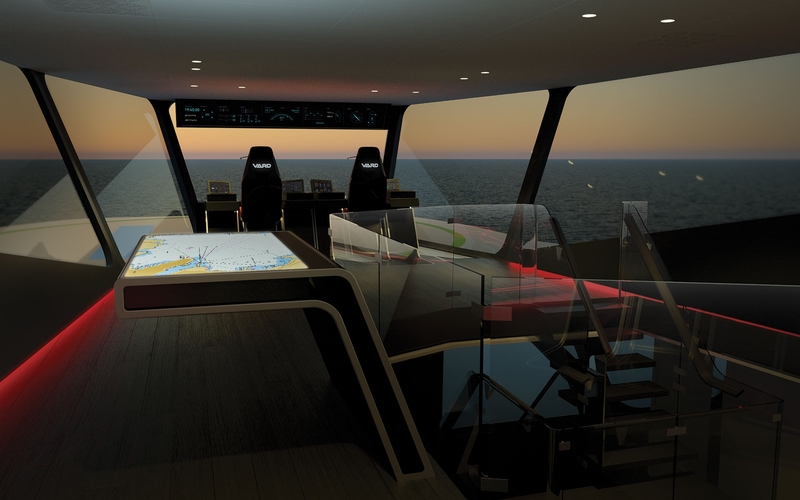 The wheelhouse/DP station hovers above the ship in a focus-enhancing ‘cockpit’ constellation. The traditional bridge below becomes a general-access, multi-purpose room. Both are units in a modular bridge design that can be utilized across multiple boat designs. 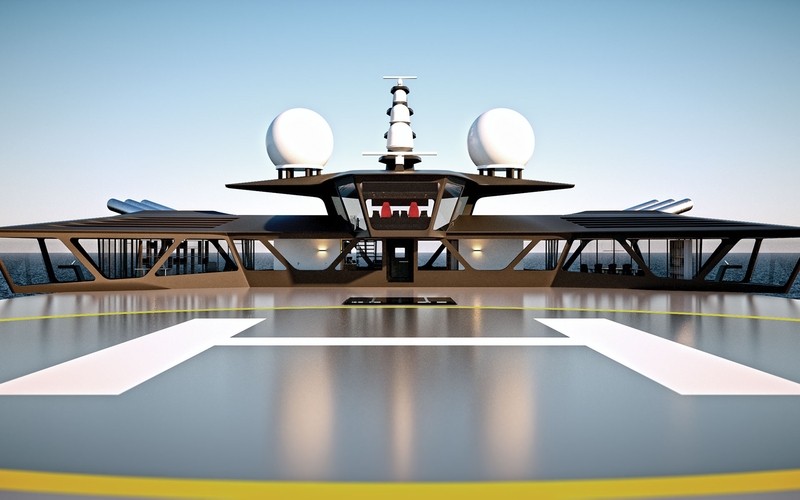 The helideck design integrates fully and seamlessly with the multi-purpose bridge and general ship architecture, allowing for easy access for visitors both arriving and departing. Built into the structure of the ship, the helideck is larger than conventional decks and easier and safer for helicopters to land on – a welcome feature in harsher conditions. 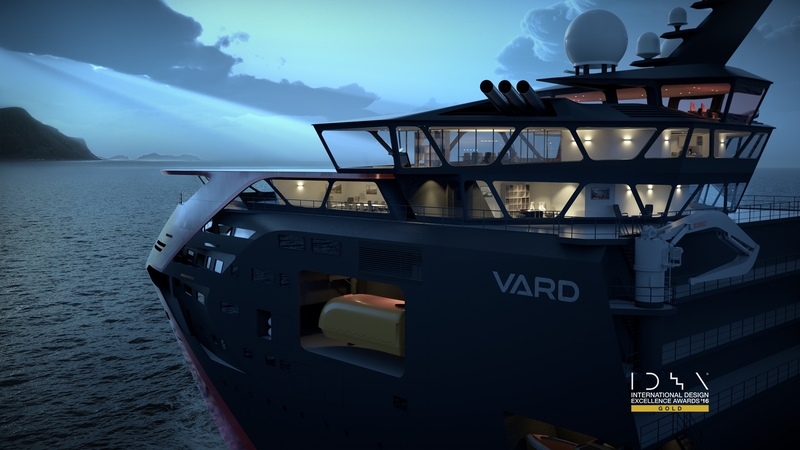 VARD is a major global designer and builder of specialized vessels used in the offshore oil and gas exploration industries, as well as production and oil services. 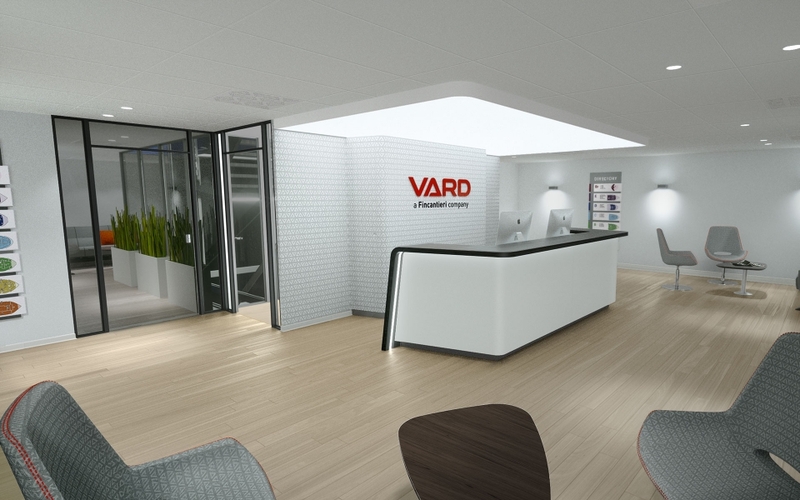 VARD’s long shipbuilding traditions, cutting-edge innovation and technology coupled with its global operations give the company significant standing in the fastest growing oil exploration markets. 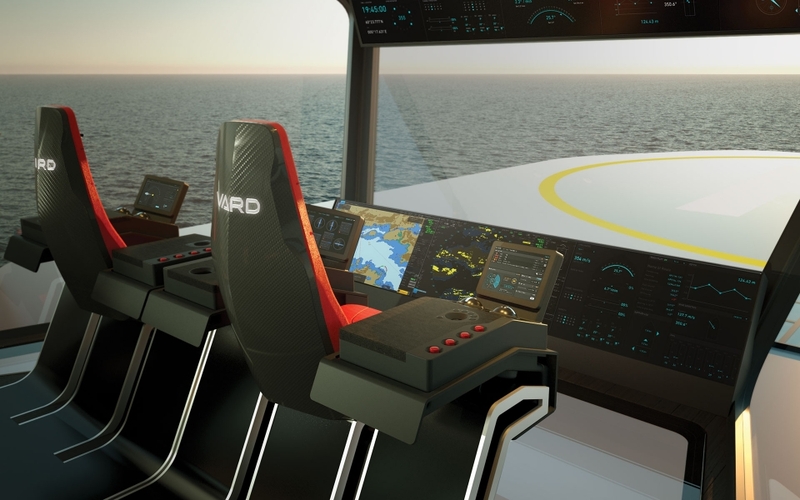 Kicked-off with extensive and immersive research, and achieved through close working relationships with all VARD stakeholders, the resulting VARD/Montaag collaboration, named “A Step Forward,” makes its debut at Nor-Shipping 2015, in Oslo, Norway. 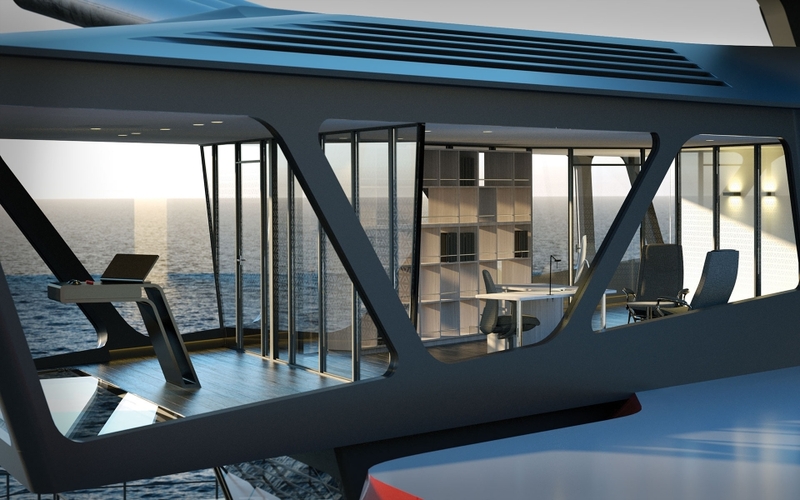 The exterior of the VARD near-future OSCV cuts an unmistakable profile on the horizon. 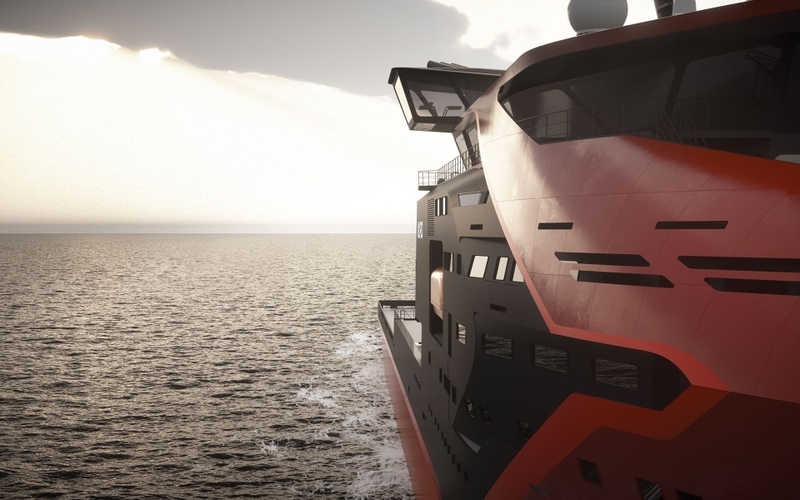 Designed to further increase the ship’s efficiency, durability and sustainability, the exterior details are integrated to unprecedented levels, and directly informed the layout of the ship’s interior. The configuration increases visibility from the bridge, lowers the center of gravity, and maximizes both fuel efficiency and deck space. 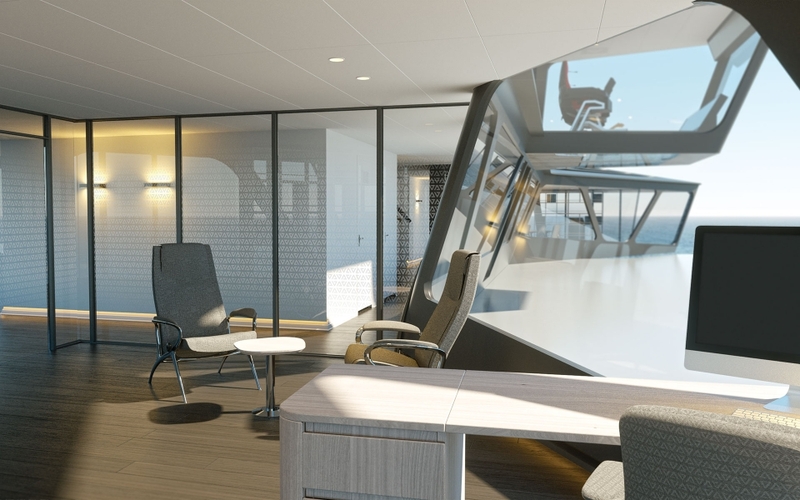 The helideck design integrates fully and seamlessly with the multi-purpose bridge and general ship architecture, allowing for easy access for visitors both arriving and departing. Built into the structure of the ship, the helideck is larger than conventional decks and easier and safer for helicopters to land on—a welcome feature in harsher conditions. 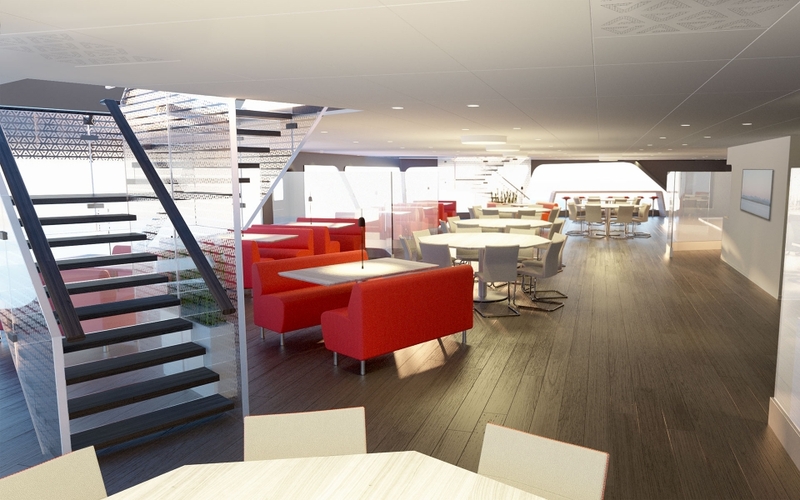 Creating a 21st Century “home away from home” is the overarching design principle for the ship’s interior architecture. 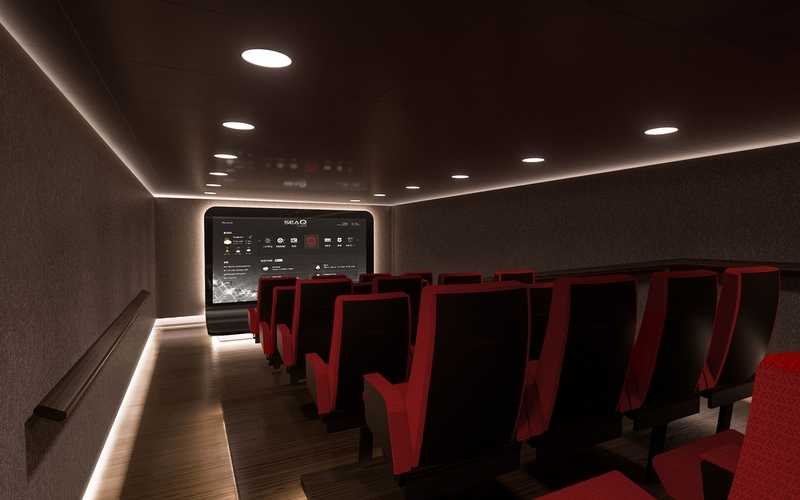 This has meant complete focus on improving the quality of on-board living and user experiences. 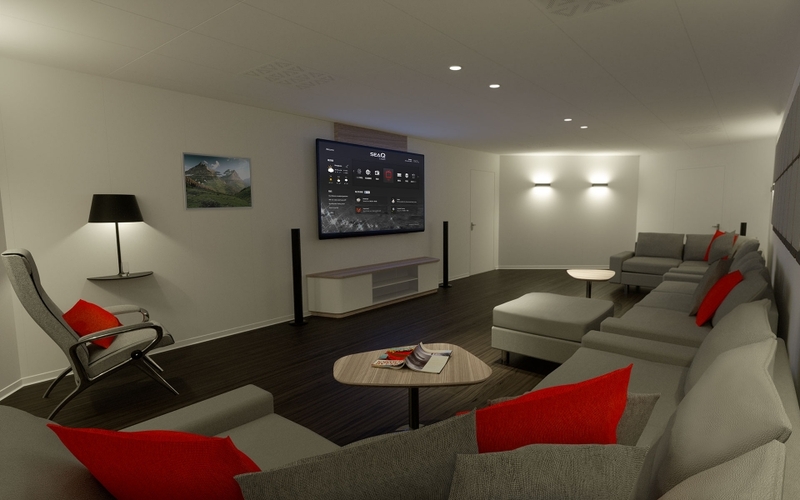 For example, larger, more traditional dayrooms have been replaced by a series of smaller, efficient and unique social areas that are cosier, more welcoming, and offer different opportunities for relaxation or socializing. Additionally, by providing onshore-level connectivity on board, old ship-bound socializing paradigms are replaced by new. 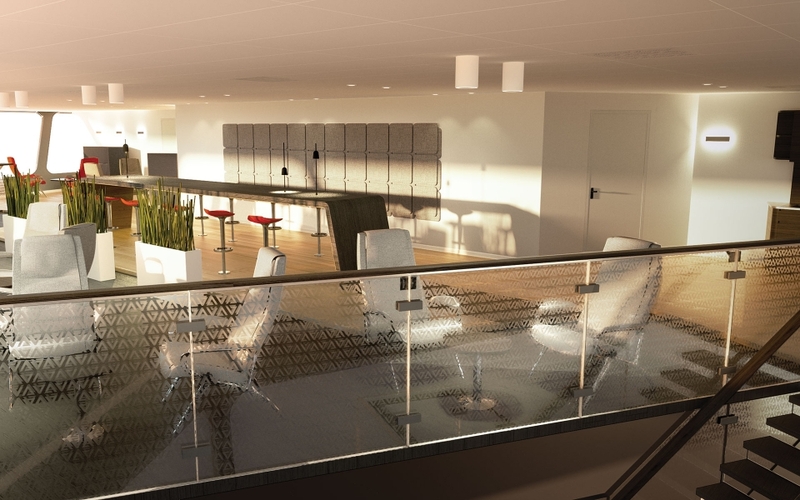 These and similar considerations extend throughout all living and working spaces. 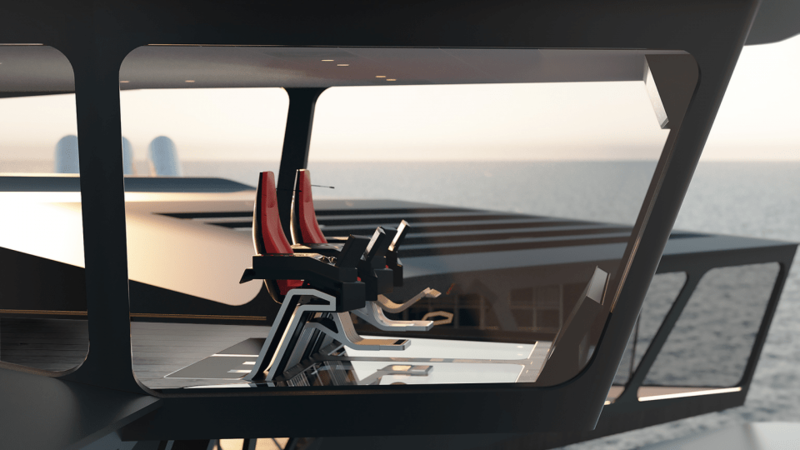 Uniting them all is a recognizable form and graphic language, designed to easily distinguish a VARD ship’s interior from its competitors. 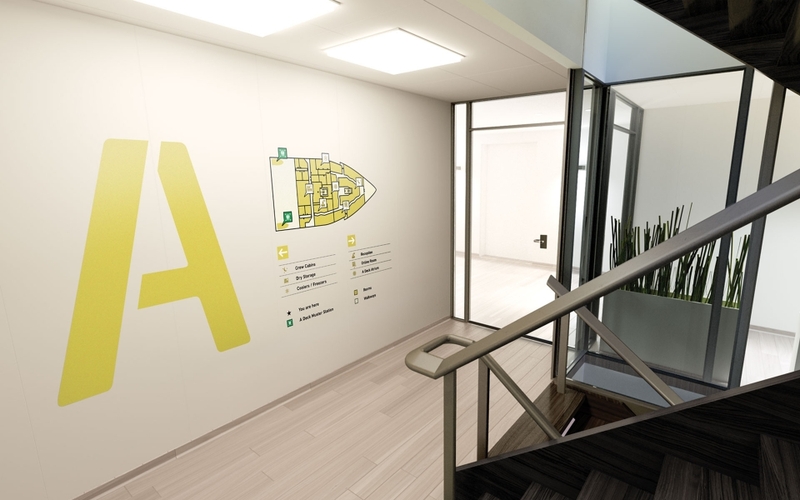 Frequent, meaningful and intuitive wayfinding signage with higher legibility makes navigating the ship both safer and more user friendly. 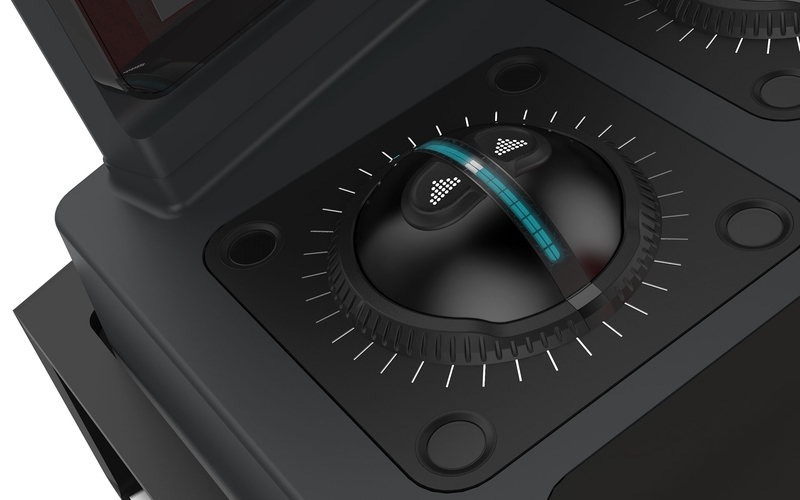 A robust system of graphics and icons works to alleviate disorientation and enable the user to more easily and quickly learn his or her way around the ship. 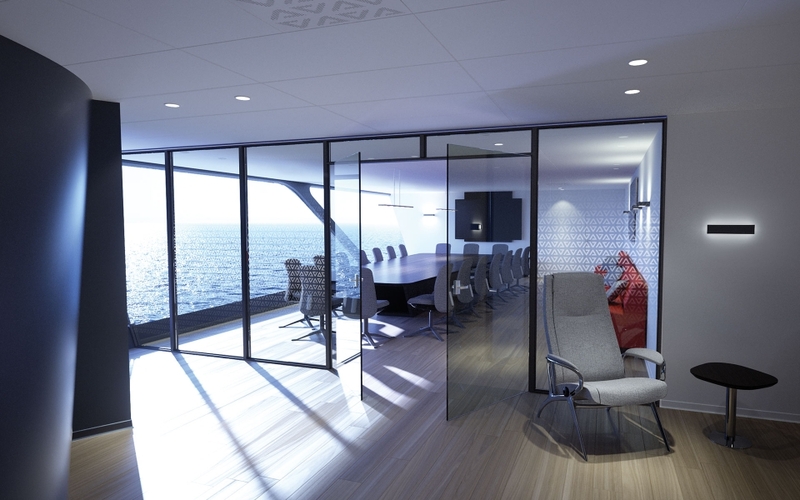 With sweeping ocean views and plentiful light, the conference room provides a bright and positive work environment and facilitates focused collaboration. The room connects to a smaller breakout room designed for small discussions and informal meetings, and creates a gathering place before and after meetings. 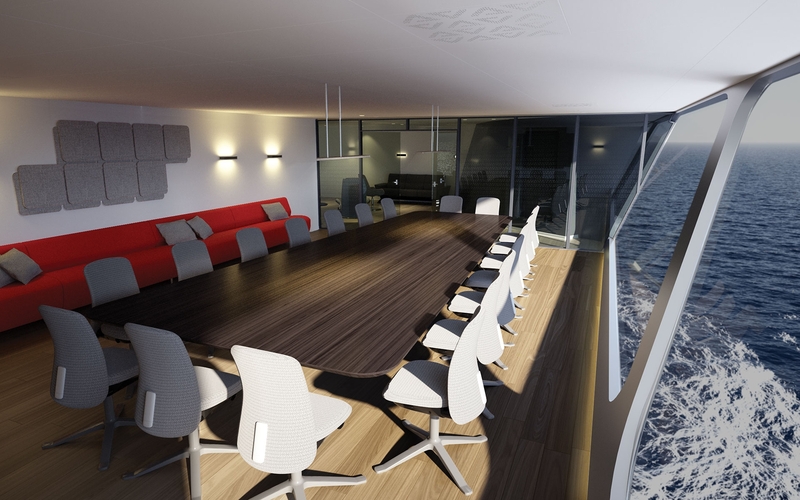 The rooms and furniture are carefully balanced, allowing for free movement of people, both before and during a meeting. 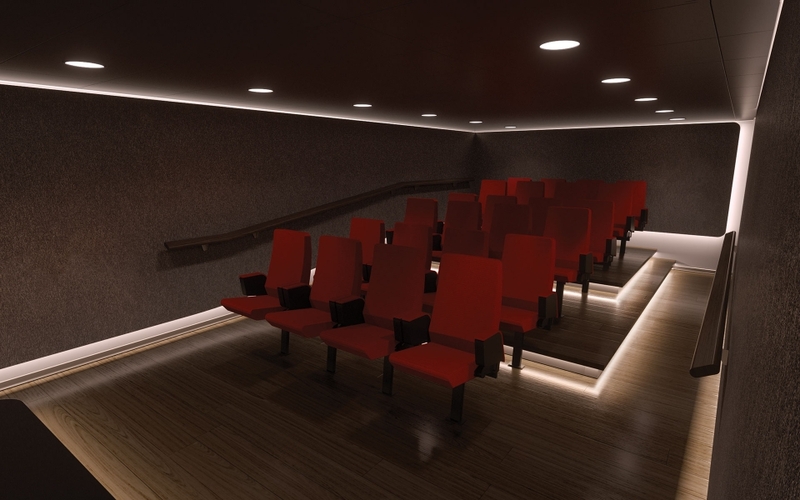 Benches along the back wall provide overflow seating so no one is ever left standing. With large windows allowing for natural light, sweeping views, and access to an outdoor terrace, the mess room is a refreshing environment. Semi-transparent dividers separate the space from serving area to dining area. Versatile seating options give the crew the ability to sit and socialize in large groups, smaller booths, and to sit alone at the bar. Layout ensures that the line does not interrupt the dining area and flows smoothly through the three serving stations. Galley entry behind serving station allows easy access for the cooks, and a connected scullery and serving area provide easy transfer of dishes and food containers. 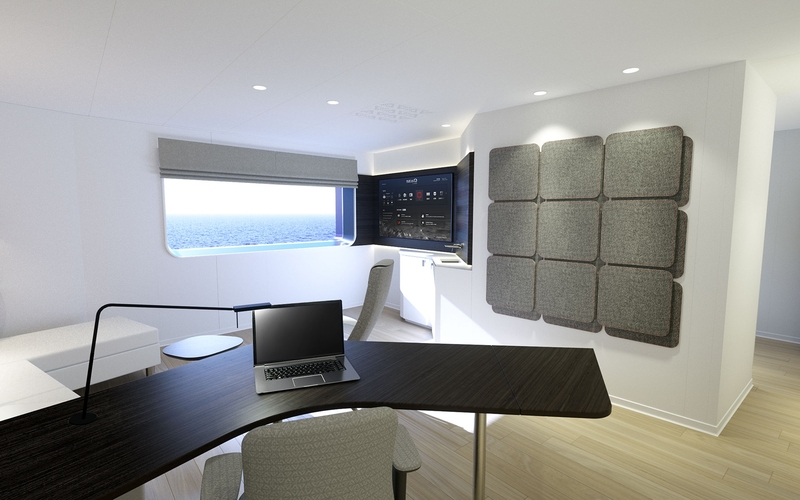 Creating real opportunities for privacy and personal space were serious drivers for the entire ship, but especially important with regards to crew cabins. 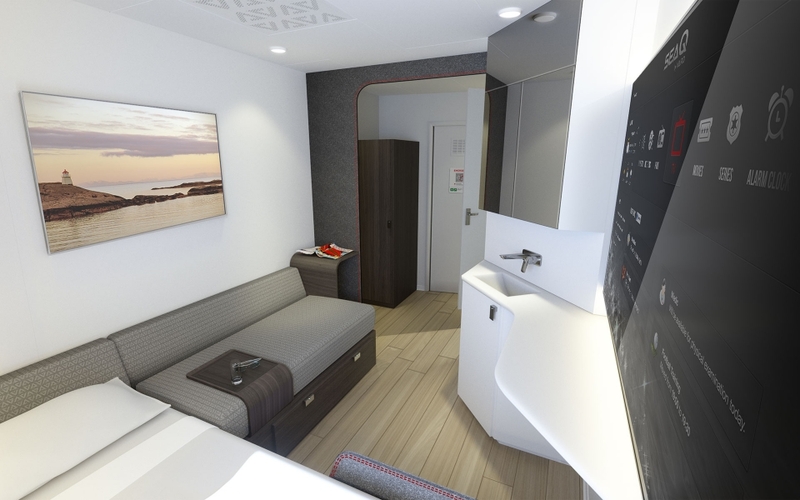 Montaag designed a layout that provides all crew members with their own private sleeping and living quarters with a shared bathroom, unprecedented on a ship of this caliber. 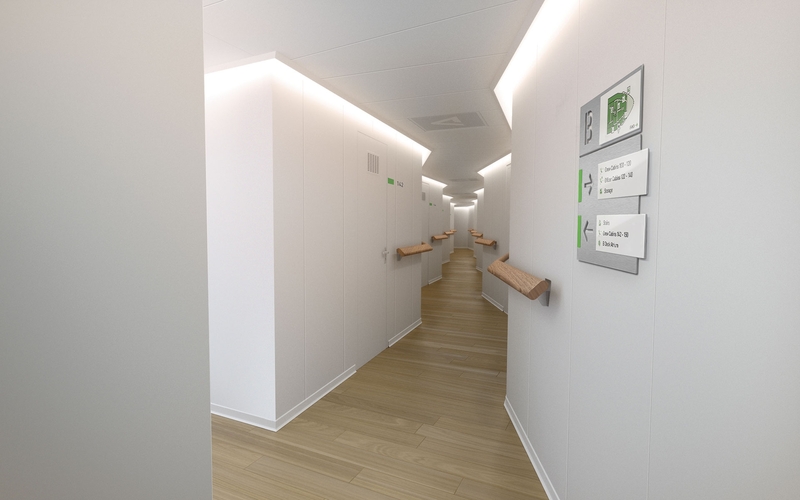 Flexibility and efficiency define these cabins. Larger than the standard cabins, the Captain’s cabin has ample daylight and generous windows. A private bathroom divides the sleeping and living space, which includes an office area and a sitting area with large sofa, recliner, and coffee table for relaxation and socializing. Felt panels add warmth and visual interest to the living space and reduce any noise from the wetunit behind. The integrated Corian countertop and sink provides a wet-bar with space for a mini-refrigerator. 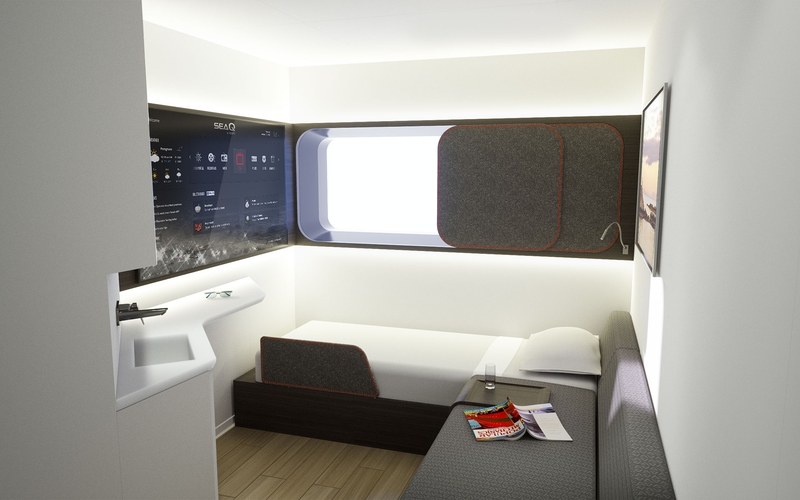 The smart digital wall display is placed in both the sleeping quarters and living quarters, allowing the captain to connect and transform his space to his desires. 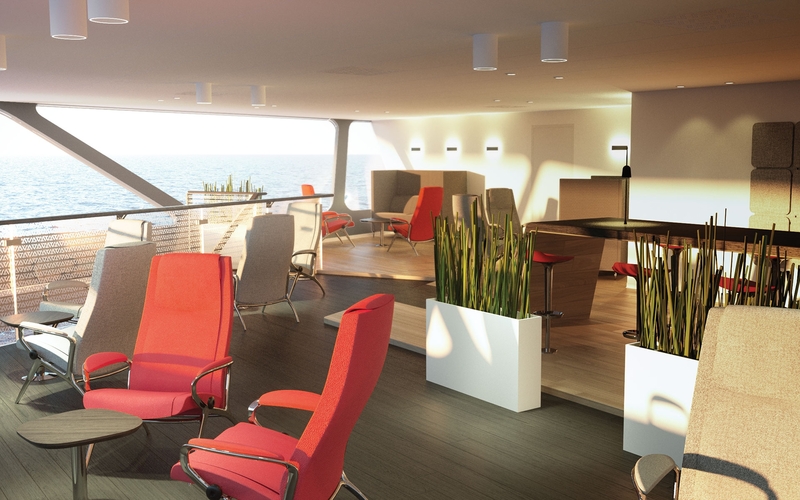 With fantastic sea views and natural light, the expansive, aptly named Ocean Lounge is the perfect place for watching the sun set on the open ocean. 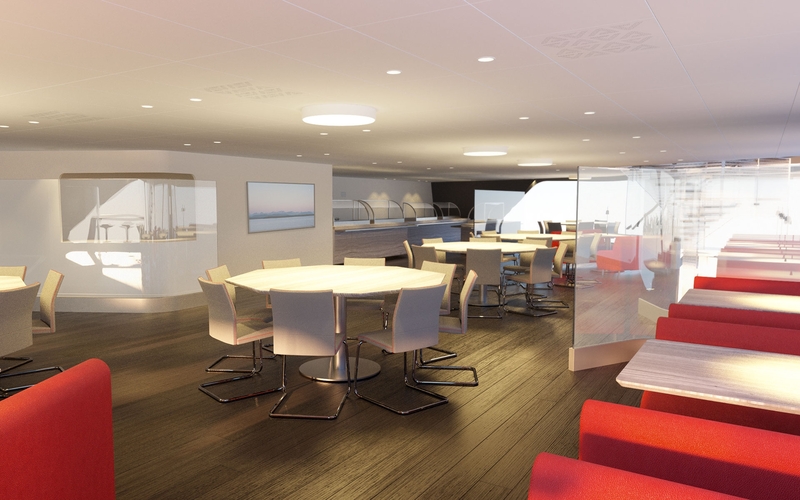 Directly above and connected to the Mess Room, the Ocean Lounge features four separate areas that allow for several activities. 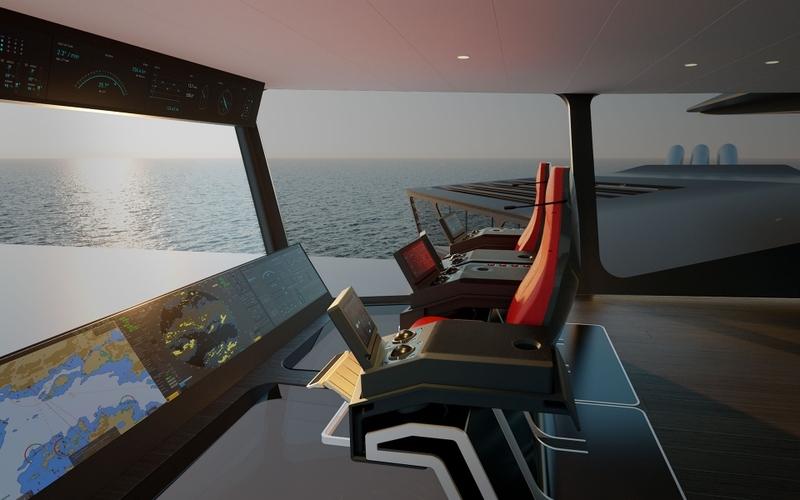 Heightened focus, smoother, more efficient workflows, and an overall enhanced bridge experience for those stationed here – these are the attributes of the new VARD bridge system. 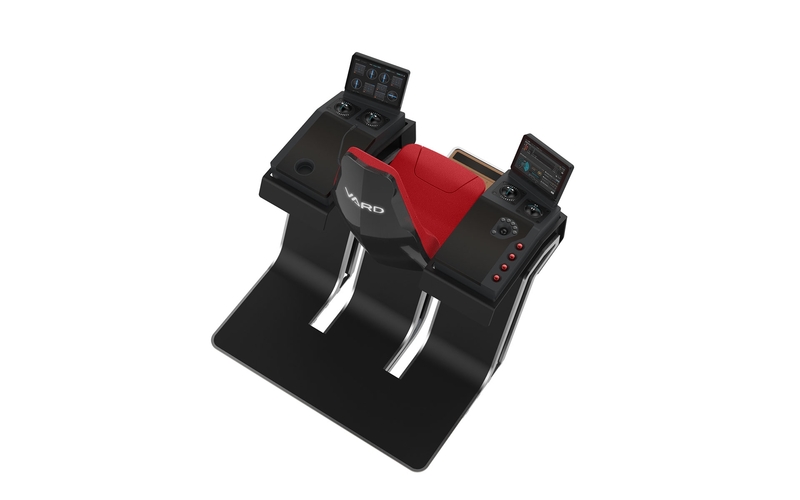 Starting with the deconstruction of experiences from the traditional Captain’s and DP Officer’s chairs, all the way through addressing the complex array of bridge devices and respective interfaces, this new bridge constellation takes advantage of every opportunity to streamline work while increasing comfort—both physical and psychological. A bridge constellation unlike any other brings fresh opportunity for streamlined communication between officers in different areas, while providing a dynamic and uniquely focused control environment that provides an unprecedented field of vision. 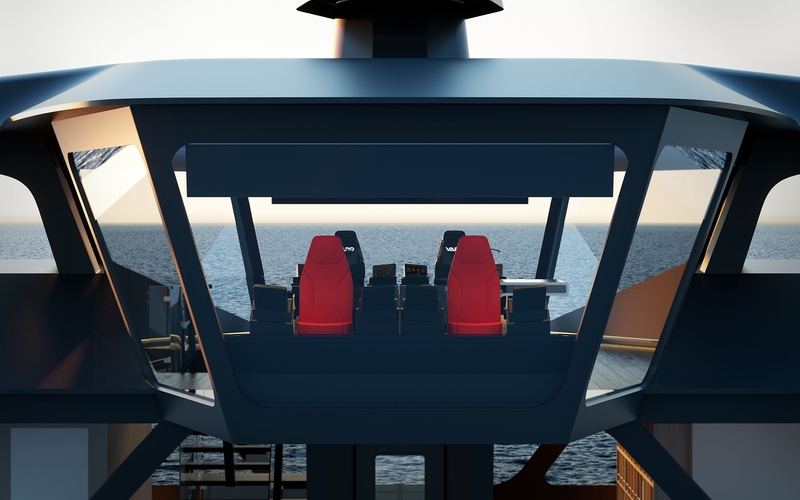 The Captain sits perched above the ship, overlooking the helideck, in a compact, comfortable and focused environment called the Cockpit Bridge, which boasts a 360 degree, uninterrupted view of the ocean. 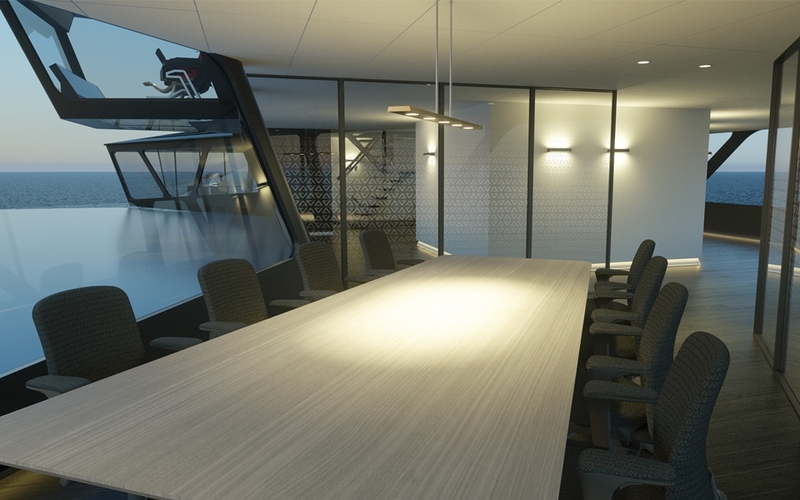 The main bridge level is focused around an open floor plan giving the occupants a spacious, tailor-made and highly attractive professional work environment, as well as unobstructed, clear views to the exterior. 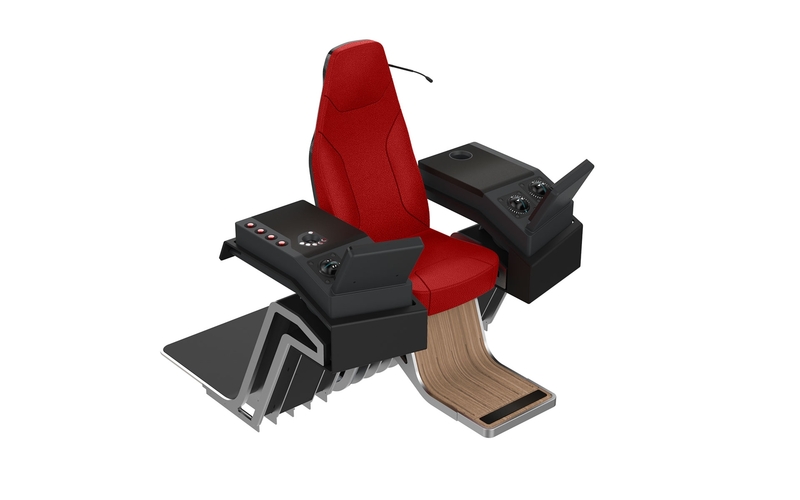 This is a distinctive mariner’s chair built for absolute comfort and concentration. Comfortable yet supportive for long stretches of sitting, the Captain’s Chair seat is upholstered in supple, sturdy leather, and framed in light, rigid carbon fiber. The headrest features an integrated gooseneck microphone for non-taxing, hands-free communication. 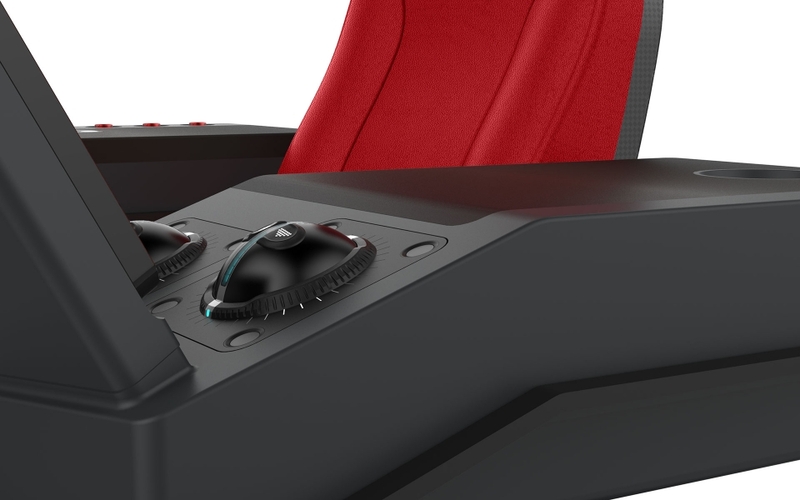 A radical user-experience departure, both functionally and ergonomically, the levers’ domed design language fits perfectly in the hand and provides precise tactile and customizable haptic feedback. 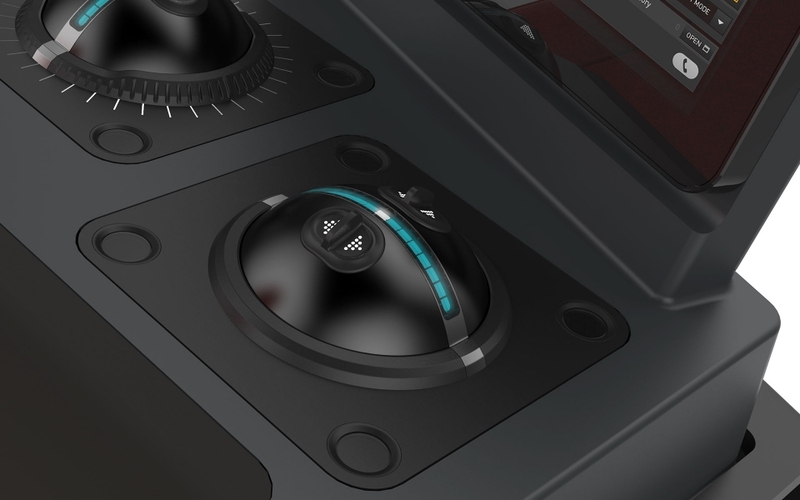 The super-low profile frees the area immediately beyond the levers, allowing the user to reach the touch interface with minimal hand movement, providing not only a technological step forward, but also a new paradigm in ergonomics and comfort.